Nourish Kefir: lovely … milky milky! Now for my first full post on a non-beery topic, although some similarities are apparent, especially in the way the concoction in question is consumed. Kefir is one of a number of fermented milk drinks made and consumed in large quantities around the world but not well known in the UK or other Western markets. Thought to originate in the northern Caucasus, this example, Nourish Kefir, comes from a dairy near St. Pancras, London. Carr Foods, the company behind Nourish, is seeking to raise awareness of this ancient beverage and has already achieved a decent level of distribution for Nourish, largely in the greater London area but increasingly further afield. My bottle came from very near its point of origin, Alara Wholefoods in Marchmont Street, just down the road from St. Pancras station. The product itself offers a slightly lactic but still obviously milky experience. The overall effect is one of a persistently sparkling, unsweetened yoghurt drink with a slightly coarse mouthfeel. As with other distinctly sour products, Nourish Kefir could prove something of an acquired taste for many readers. This wasn’t a problem for me however, having developed a taste for much more sour drinks around 20 years ago when first exposed to traditional Belgian lambic beer. With raw milk very high on my list of favourite drinks (after beer), I’m subsequently quite keen on kefir. The rough mouthfeel is, I assume, the result of kefir’s fermentation. This involves a symbiotic combination of lactic acid bacteria and yeasts in a matrix of proteins, lipids, and sugars, known as kefir “grains”. These grains grow as they metabolise the lactose in milk coming to resemble cauliflower in form. They can then be transplanted to start a new batch of kefir after a few days or strained from the current ferment which can then be stored or drunk. A small amount of alcohol – up to around 2-2.5% – is typical in kefir fermentation and is seemingly a selling point in commercial products sold in Eastern Europe. Indeed, as far as I can tell the alcohol is an important constituent of products such as kefir which appear to have served a similar function to low alcohol “small beer” in the societies where they originated. To some extent they still do. 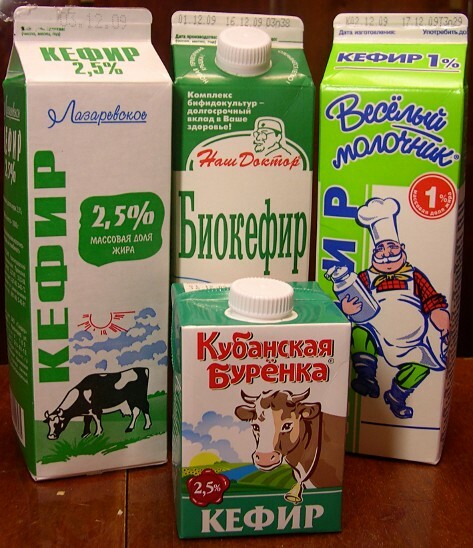 Kefir is a common comestible in eastern Europe. Much of the interest in kefir on the Web surrounds its “probiotic” credentials, hence the Nourish version’s most regular retail outlets in health food stores. While kefir’s purported health benefits may provide an enticing reason for many readers to try it I’m rather more interested in its historicity and the fact that beverages such as kefir have clearly played vital roles in the cultures they emerged from both as foods and for social cohesion. Nourish Kefir has certainly sparked my interest in kefir and I’m now looking to make it myself using grains I plan to buy on eBay. It’s also drawn my attention to similar products such as the central Asian koumiss, made from mare’s milk using a liquid rather than solid starter culture. There’s also blaand, a fermented whey drink apparently brought to Scotland by vikings and now available to buy from (very) specialist outlets in the form of Fallachan. Then there is genuine old-fashioned ginger beer made using the gelatinous “ginger beer plant”, a matrix akin to kefir grains and comparable to a substance now more commonly described as “water kefir”. This method of fermenting ginger beer pre-dates the direct pitching of yeast but is now almost extinct in Britain. As a lover of ginger beer, I’m keen to try the original. A whole new world of home brewing has just opened up for me. Watch this space for more adventures.